Thanks to Megan Media and Tropicana, a brand I’ve loved since childhood, for sponsoring this post! I was compensated for my time, but as always, all thoughts and opinions are my own. Thanks for supporting the brands that make this blog possible! Anyone else have a tummy that can be a bit, umm, sensitive? I feel your pain - literally! As someone who suffered from IBS for years, and regularly works with clients suffering from gut conditions, I definitely understand how frustrating tummy troubles can be. There are so many factors that impact gut health, so finding a solution can be tricky. The gut-brain connection is so powerful that some scientists refer to the gut as the “second brain.” If you’ve ever had “butterflies in your stomach” or a “gut reaction,” then you’ve experienced the gut-brain connection for yourself. Stress and tummy troubles can become a vicious cycle - studies have shown stress can trigger IBS symptoms and disrupt the gut’s microflora, and poor gut health can increase symptoms of depression and anxiety. Break the cycle by prioritizing stress management. If you lead a busy life (hi!! Me again! ), the idea of stress management might seem time consuming, but it doesn’t have to be. I’ve found the most benefit from practicing mindfulness when I walk the dogs each morning, and by taking deep breathing pauses when I catch myself starting to get stressed. Yoga has also been a lifesaver for me, and I especially love to do yoga for digestion when I notice symptoms begin to flare. The healthy bacteria in our gut definitely have some food preferences - they love to eat plants! While I occasionally recommend fiber supplements for therapeutic reasons, it’s food first for fiber. That’s because whole foods contain many different types of fiber -lignin, cellulose, beta-glucans, pectins, etc - you just can’t get that in supplement form! While I’m not big on food rules, I do think it’s smart to aim to get some type of produce in at each meal, choose whole grains most of the time, and enjoy a few bean based meals each week. Probiotics are strains of health-promoting bacteria. Eating probiotic foods on the regular helps replenish these healthy bacteria in the gut. There’s a few different food sources, but one can only eat so much kimchi and yogurt. 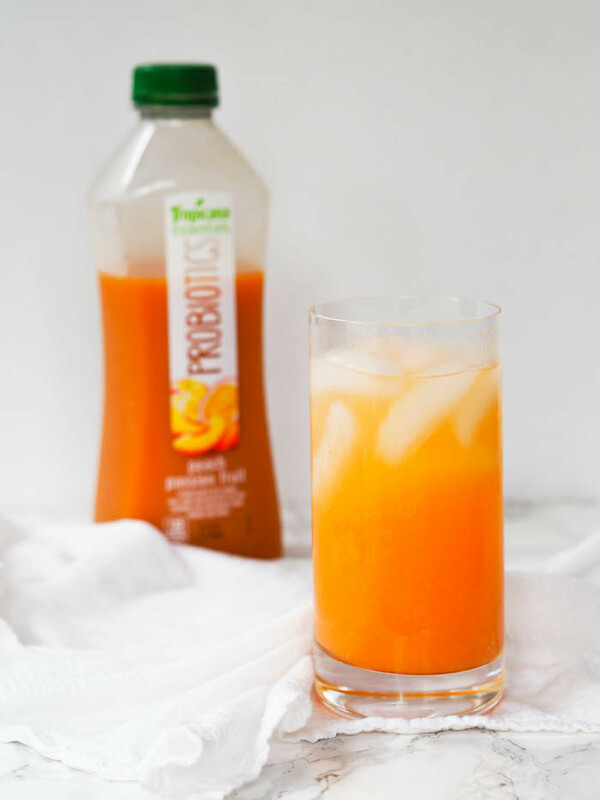 That’s why I was so excited to learn about Tropicana’s new line of probiotic juices! 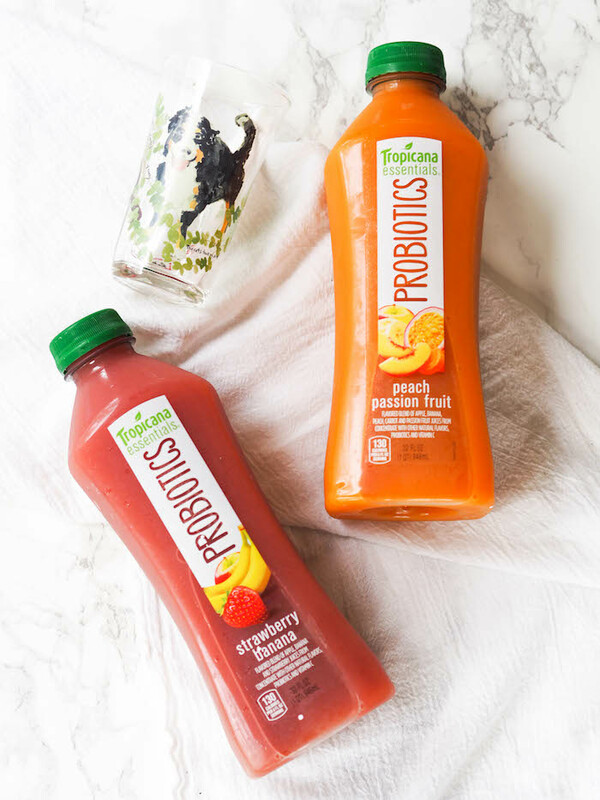 True story - I started every day with Tropicana orange juice as a kid (my parents were big Tropicana snobs), and I’m going to get back in the habit with these probiotic juices! There’s three different fresh flavors - Strawberry Banana, Pineapple Mango, and my personal favorite, Peach Passion Fruit. Enjoy a cup with breakfast (I’ll take any excuse to break out my Bernese Mountain dog juice glasses - yes, I actually own such a thing) or use it to add sweetness and tropical flavor to your morning smoothie. I made my classic green smoothie with half Strawberry Banana and half almond milk and it was so refreshing! I also love to make fruit juice fizzes, especially when it’s hot out. Just fill a glass with ice about a quarter of the way full of juice, then top off with seltzer. If I ever notice my stomach feeling a little wonky, I don’t freak out. I consider it a warning sign that something in my lifestyle is a little out of whack. When I get back to these three simple steps, my stomach is back to it’s usual content-to-eat-whatevers-on-the-plate self in no time! How to you keep your tummy happy?